Ever Wish Your Veggies Would Taste Like Pizza?? With This Dish They Do! We can’t get enough of pizza…so much so, in fact, that whenever we get a chance to recreate that classic pizza flavor, we go for it. Here, we knew we wanted to up our veggie intake, but since zucchini has a pretty mild flavor we figured it’d be the perfect vehicle for cheesy tomato goodness…and we were right! These mini pizza bites are super tasty and have us enjoying eating our vegetables instead of just tolerating it. They’re perfect for either casual home dinners or entertaining (healthy game day snack, anyone?) and we can’t wait to make them again! Preheat oven to 450ºF and lightly grease a rimmed baking sheet with non-stick spray. Place zucchini rounds in a large bowl and drizzle in olive oil. Toss well so that each round is coated in oil. In a shallow dish or small bowl, mix Panko and parmesan cheese together until combined, then season with salt and pepper. In batches, press both sides of zucchini rounds into Panko mixture, pressing firmly so it adheres, until they’re all thoroughly coated. Transfer zucchini to baking sheet and roast for 20-25 minutes, or until breading is golden brown. 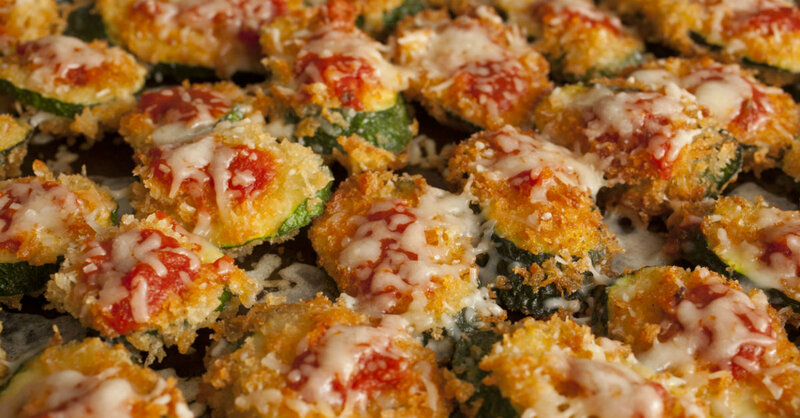 Remove tray from oven and spread a small amount of marinara sauce over each zucchini round. Sprinkle mozzarella over the top and return to oven. Bake for another 5 minutes, or until cheese is melted.